Kaokoland is a beautifully remote and wild area that deserves respect. Be an eco-traveller and do not cause track pollution; stay on the beaten tracks or roads and do not disturb any plants, especially the Welwitschia. 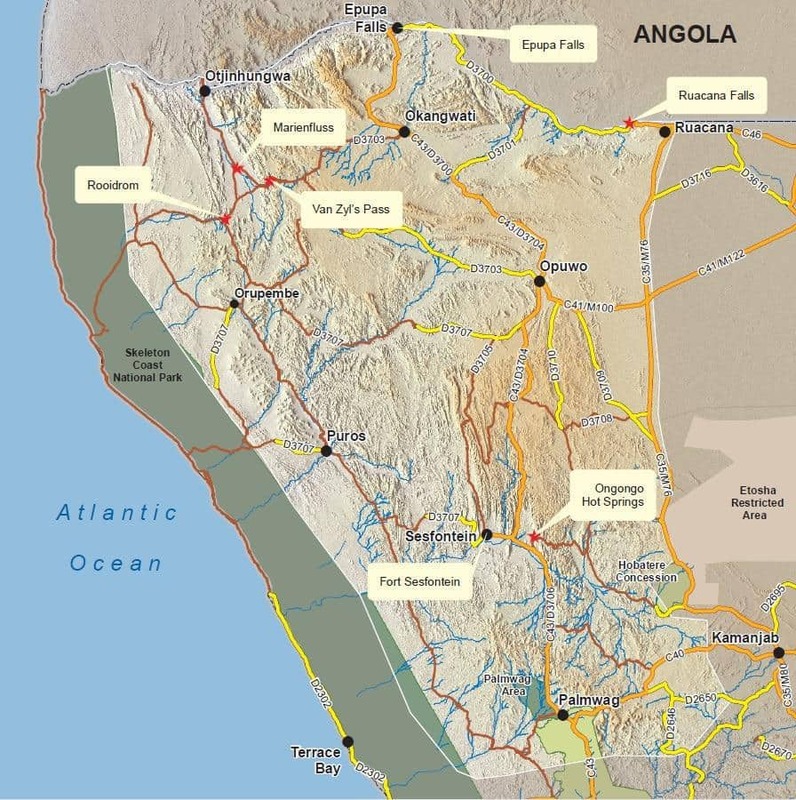 This region lies in the extreme north-western corner of Namibia and is bordered in the north by the Kunene River and in the west by the Atlantic Ocean and the Skeleton Coast National Park. 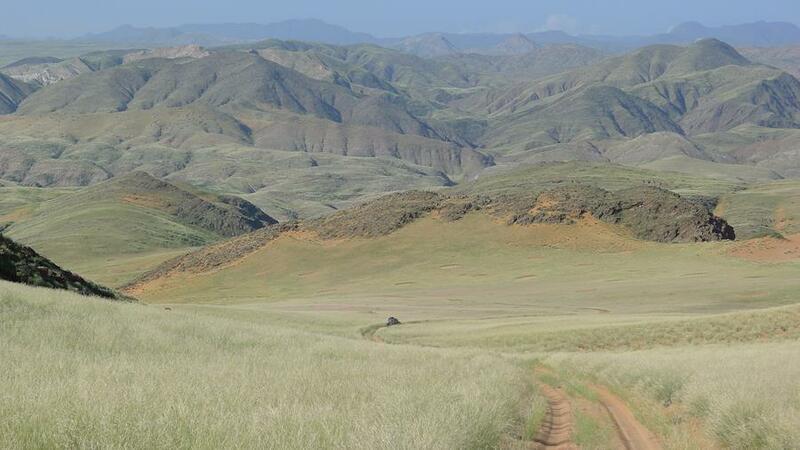 The landscapes of Kaokoland range between sweeping plains, rugged mountains and dry riverbeds seamed with lush riparian bush. Koakoland has a lot to offer in terms of natural beauty. The life-giving Kunene River has many waterfalls and rapids of which the most spectacular are the Ruacana Falls and Epupa Falls. The Marienfluss is a long, wide valley covered in soft wavering grass for most of the year, set between high, stark mountain ranges. It can be entered in the south via Van Zyl’s Pass, or on the track passing Rooidrom. The area contains some beautiful fairy circles. 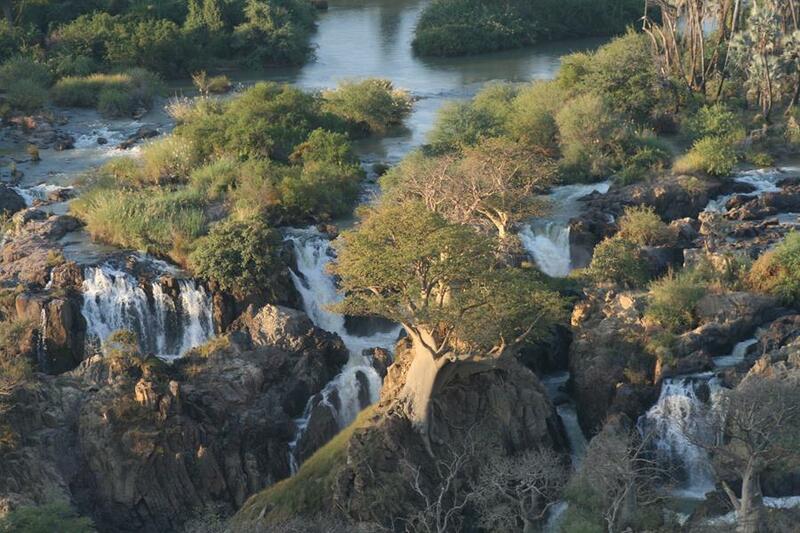 Epupa Falls is quite spectacular after good rains. 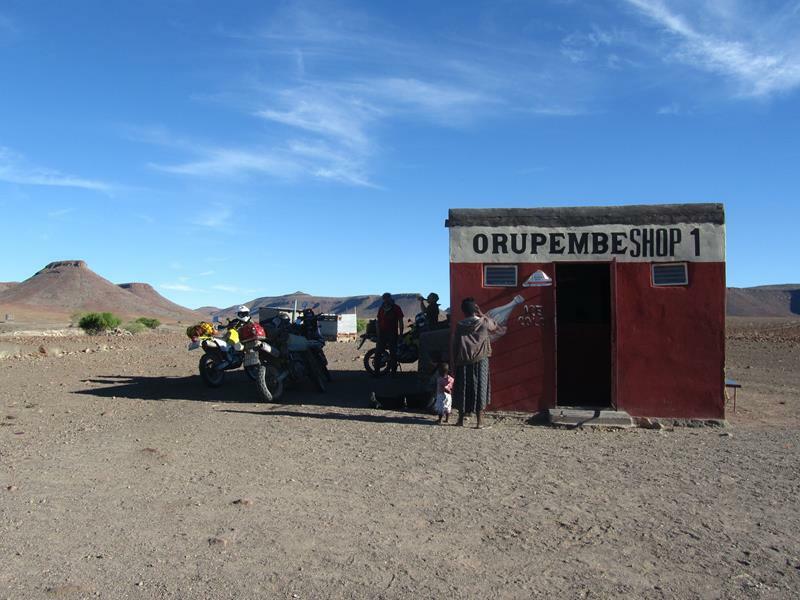 (Photo: Johann Groenewald) Life is simple, almost uncomfortable in this region therefore the traveller has to prepare properly for a harsh but nevertheless beautiful and rewarding experience. You definitely need a 4WD to tour Kaokoland and you would be wise not to take a trailer as these roads are rough and only a lucky few have survived them. A satellite phone or one of the new generation satellite communicators with SOS function is a must when you travel Kaokoland on your own. The roads are dusty sand or gravel, often no more than simple tracks, which can easily become flooded if rain falls. Van Zyl’s Pass For many keen 4WD travellers and a few brave motorcyclists Van Zyl’s Pass is a challenge they cannot resist. It is usually only travelled from east to west (downhill) although the brave and crazy have also done it the other way. The road is very bad and you can only traverse it with a 4WD or an off-road type motorbike, not bigger than 650cc. However, you need outstanding riding skills on rock and sand to be able to make this transit. A trip down Van Zyl’s Pass usually starts off in the early morning from Ruacana, Opuwo, Epupa Falls or from lodgings somewhere along the Kunene River. You should plan to stay over at the Van Zyl’s Pass Community camp. The road from Etengwa to Otjitanda is as bad as the road down van Zyl’s Pass. So, when you reach Otjitanda you will know if you are sufficiently comfortable with your driving or riding skills, and can continue to Van Zyl’s Pass. If not, take the road south from Otjitanda leading to Orupembe. You have to be aware of desert elephants, especially in the dry riverbeds. They are not used to humans and they don’t like being disturbed, having a comfort zone of at least 500 m. As the dry riverbeds belong to them, you are advised to rather avoid these. Chances are good that you might also encounter rhino, lion and leopard. The Himbas Kaokoland is sparsely inhabited and here you will find the nomadic cattle herding Himba who live in simple round huts. Respect them and their culture. They have a number of holy places spread throughout Kaokoland, as indicated on Tracks4Africa’s GPS maps, and you need to ensure that you do not camp on or near them. Kaokoland is mainly communal land that is divided into Conservancies. 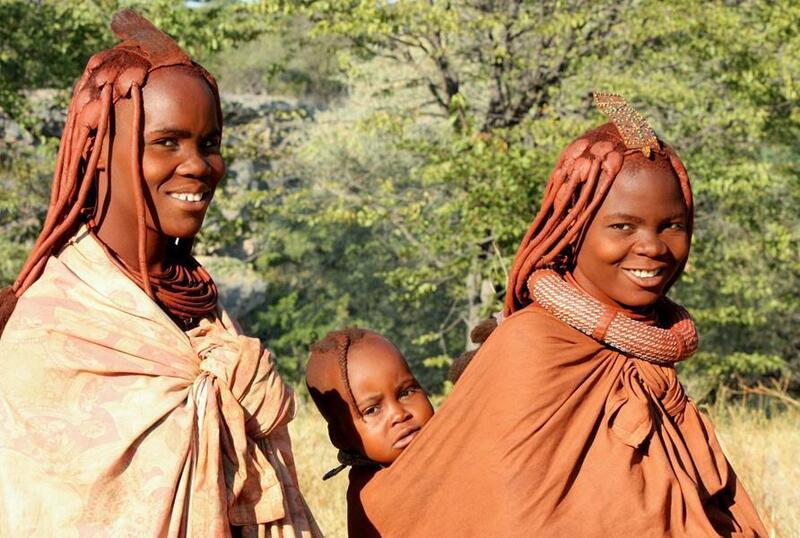 The Conservancies are managed by the local communities, who own the land rights and are responsible for the wild game. Money spent at community camps stays within that community. Remember to take your own litter with you when you leave, as they live in a very natural way and do not have techniques for disposing of your rubbish. When you drive past a village, keep your speed down so as not to cover them in your dust and give them a polite wave. Beware of cattle stampedes if you camp near Himba villages. Their cattle have adapted to feeding as far as 35 km away from water and only return to drink every second or third day. The return to water normally happens at nightfall or later. Over the last 5 km they can smell the water which excites them and can cause a stampede. Rooidrom Rooidrom is a red,45 gallon Caltex drum that was put in that location many years ago by farmer Ben van Zyl as a way of storing petrol for when he would next need it on passing. Its purpose, however, changed to become a well-known landmark at the split in the road for which it is known (via jay at dress head.com). 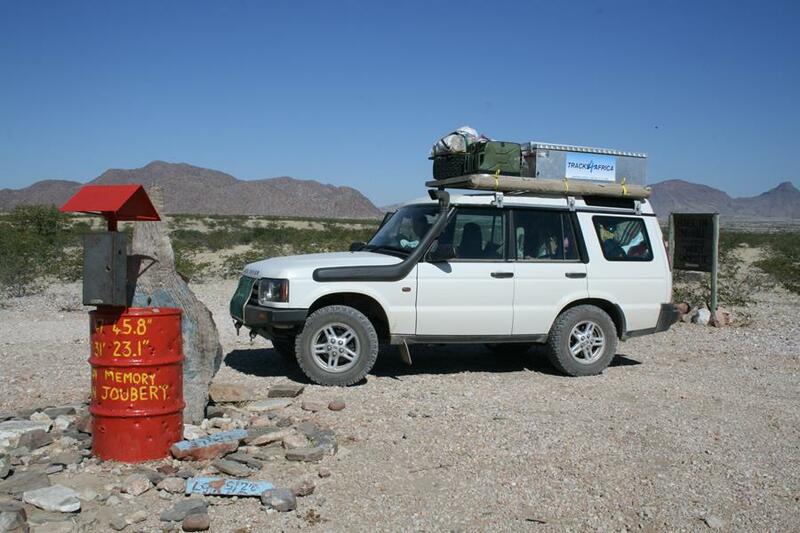 Some fellow travellers regularly paint it and it later also became a memorial for Jan Joubert who was a pioneer in marking the 4×4 trails of Namibia and was killed on one of his excursions into Kaokoland. 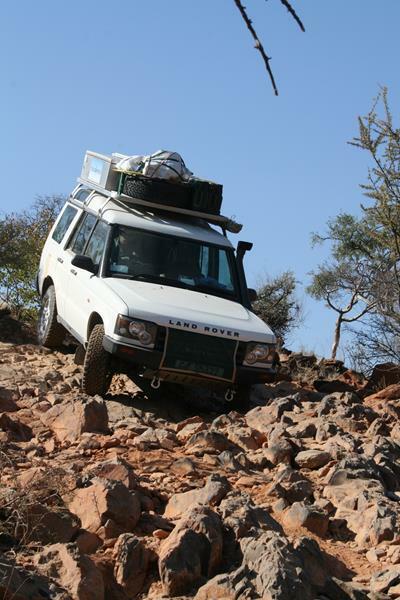 When you plan on travelling Kaokoland, don’t go without the Tracks4Africa Self-Drive Guide for Namibia. It has loads of information on destinations and places to stay in Kaokoland. Thanks so much for the information. Am looking forward to do a short overland trip around kaokoland. That last travel of him was the Bushmansland part of the Dorsland Treck and not the Kaokoveld part. “Members of a security company in Gobabis found his vehicle near the Epaku township on Wednesday night. Do you (or anybody) have solid Information if there is a fuel station (gasoline) available at Puros? Christoph, I have it first hand that there is container fuel available at Puros, Okangwati and Orupembe. You can count on getting about 20 litres per stop. Hi Karin, thanks a lot! That´s very helpful Information. Not exactly sure what a “container fuel” is, but I guess thats kind of an automatic gas station within a container. Do you know what kind of fuel they offer (petrol or diesel)? Cheers, C.
‘Container fuel’ means there is no fuel pump. The local people are selling fuel (diesel and petrol) in containers. Normally this fuel can be suspect as it might not be clean. Best is to only use it when you are desperate. Perfect! Good solution even for more optimistic than desperate travellers 🙂 Best, C.
Hi Karin, as always I very much enjoy reading your very informative articles such as this one on travelling Kaokoland. I feel, however, I should draw attention to two ‘statements’ which could create wrong perspectives. Firstly, Ben van Zyl wasn’t a farmer (at least not when he opened up Kaokoland), but the Government Commissioner (or Bantu Affairs Commissioner in those days) of Kaokoveld (as it was first known). Secondly, Jan Joubert wasn’t killed on an excursion into Kaokoland, but north of the town of Gobabis and, I believe, on a trip into Hereroland and further north into Boesmanland. Thank you very much for pointing these facts out to us. Much appreciated.